Medserv convened a meeting with financial analysts last week to provide additional details on the interim financial results published on August 23 and also to update the market on the current business pipeline as well as opportunities in the months and years ahead. Following the diversification strategy adopted in recent years, the Medserv group is now split into two main business units: integrated logistic support services (ILSS) via the existing facilities in Malta, Cyprus and Portugal and the oil country tubular goods (OCTG) segment via the METS group which was acquired in early 2016 and operates in Oman, UAE and Iraq. Although Medserv’s directors had been indicating to the market that the group was expecting a weak financial performance during the first few months of 2017, the actual results were worse than management expectations. The half-year report reveals that this was largely due to the ILSS unit which reported revenues of €5.8 million in the first six months of 2017, down from €10.6 million in the first half of last year. The worse-than-expected performance in this area was principally as a result of the continued delay in drilling activity offshore Libya which is serviced via the Malta base. During last week’s meeting, CEO designate Karl Bartolo confirmed that the slowdown in Malta was due to the further delay in the arrival of the rig that was earmarked for the drilling activity offshore Libya. On the other hand, although the OCTG business registered an increase in revenue in the first half of 2017 to €7.5 million (H1 2016: €6.5 million), it was also below expectations due to a continued underperformance from Iraq. Ebita during the first half of the year amounted to €1.8 million while the group suffered an overall loss of €3.3 million. In the half year report published on August 23 and also during last week’s presentation, the company gave a detailed overview of their expectations for the second half of 2017 and also for 2018. Medserv also provided revised projections for the current financial year. Overall revenue is now expected to amount to €30 million compared to the earlier forecast of €35.9 million while the projected Ebdita is now set at €4.3 million. In the coming months, the key growth driver for the ILSS division is the resumption of drilling activity in Cyprus which is expected to commence during the final quarter of this year. Medserv will support ENI’s drilling operations from its new base in Limassol while the Larnaca facility will be mainly used for storage. During last week’s meeting, executive director Godwin Borg confirmed that by the end of 2017 and mid-2018, there will be drilling activity across two or three exploratory wells in the concessions awarded to ENI offshore Cyprus. Mr Borg also indicated that another international oil company, ExxonMobil, is in the process of issuing a tender for logistical support services as a result of their planned drilling activity in another concession area offshore Cyprus. Meanwhile, the yard in Malta is preparing to receive the equipment and supplies relating to the resumption of operations offshore Libya within the next few weeks while Medserv Portugal has extended its contract with ENI to January 2019 to cater for the new operational time frame in view of the further delay as a result of the concentration of ENI’s efforts offshore Cyprus. One of the other major business opportunities for the ILSS business unit is the Egyptian market. Earlier this year, Medserv had reported that it set up a company in Egypt and it also signed a memorandum of understanding with a major Egyptian entity which will allow the company to offer base facilities out of an Egyptian port to cater for logistical services to some major oil companies operating in the region. There has been widespread international media coverage of the Zohr field which is the largest gas find in the Mediterranean region. Both ENI and the Egyptian authorities regard the Zohr gas field as a priority for development. During last week’s meeting it was confirmed that Medserv is in a very advanced stage of concluding a sizeable contract for a duration of five years and a possible extension of an additional five years. Medserv’s officials also indicated that they are discussing the potential of also offering OCTG services in Egypt in what would be a clear indication of the cross-selling opportunities that exist following the METS acquisition last year. In the OCTG segment, the second base in Duqm, Oman covering an area of 117,000 sqm will be operational as from November 1, 2017 to service the recently announced 10-year contract with Sumitomo. METS will be responsible for the supply chain management for Sumitomo in Oman of oil country tubular goods (OCTG) to Petroleum Development Oman (PDO). PDO is a joint venture between the government of Oman and Shell and the supply contract with Sumitomo is valued at $1.2 billion over five years. Medserv’s executives last week indicated that they expect to register a 16 per cent increase in volume of pipes in Oman during 2017 which is expected to increase by an additional 28 per cent in 2018 in view of the new long-term contract in hand. Although the OCTG business unit has underperformed in the first half of the year due to the continued losses suffered in Iraq, it was reported last week that activity in Iraq has already seen a strong pick-up in activity during the third quarter of the current year as the approvals of the maintenance programmes are now taking place. Medserv are also generally optimistic that the business in Iraq should report sizeable growth in 2018 following the resumption of production at the main oil fields. The major business development activity in the Middle East could potentially involve OCTG services offered by METS in Abu Dhabi. During last week’s meeting it was announced that a very large tender may soon be issued for services to be provided to the Abu Dhabi National Oil Corporation. METS intends to participate in this tender which would involve a contract of works for a period of up to five years. While Medserv continues to deliver in existing markets, the group is pursuing opportunities in new geographies to expand its global presence and support longer-term growth. In the half year report published on August 24, 2017, the directors noted that they are expecting substantial revenue growth during the next three years based on already contracted works related to drilling projects and workover programmes as well as on the assumption of securing an additional two new geographic markets by 2018. Following the meeting last week, the two markets that form the basis of the assumptions provided by the Directors are presumably Egypt and Abu Dhabi. The CEO designate Karl Bartolo indicated that the Medserv group could report Ebdita well in excess of €10 million in 2018 in the eventuality that these new contracts are awarded. In fact the UK research specialists Edison Investment Research estimate that the overall Medserv group will generate €12.5 million in Ebdita in 2018. Moreover, should the potential contract in Abu Dhabi materialise, the METS business segment (OCTG) will then become the major contributor to the entire Medserv group. 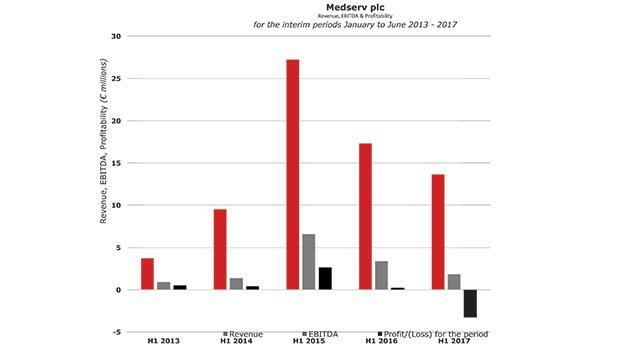 It would thus signify a substantial change from the business of previous years when Medserv was totally dependent on the support services from the Malta base as well as from Cyprus following the successful operation between 2014 and 2015 which saw Medserv generate a pre-tax profit of €6 million in 2015. The increased contribution of METS would also vindicate the ambitious decision by management to undertake such a sizeable acquisition in early 2016 to ensure that the new Medserv group is well positioned for the years ahead. The oil and gas sector has once again proved to be very volatile. Medserv’s operational performance was previously totally dependent on the timing of exploratory programmes by the major international oil companies which is in turn naturally impacted by the price of oil and gas. However, the OCTG contracts within the METS group are of a longer-term nature (such as the recent contract with Sumitomo for a 10-year period in Oman) which should provide the necessary stability for the Medserv group going forward. Investors should now await developments with respect to the potential contracts in Egypt, Abu Dhabi and other possible markets while hoping that no further delays take place in the current business operations especially in Malta, Cyprus and Iraq. © 2017 Rizzo, Farrugia & Co. (Stockbrokers) Ltd. All rights reserved.